Look out for these this Halloween, they contain melamine. 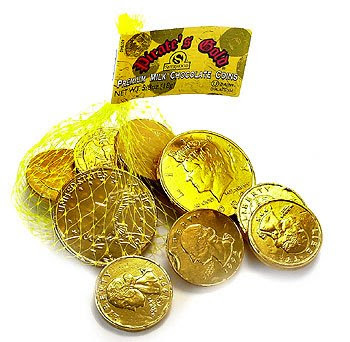 The brand is Pir@te’s Gold and it is sold in Canada through Costco, but might have made it to dollar stores in bulk packages or individual coins. If you’re like me and doubt every forwarded email you receive, you can read about it on Snopes here or on Consumer Reports here. Interestingly enough, it was my 8 year old that told me about these. Apparently she heard about it at school and came home and told me to make sure that I knew about it and that I should look through her candy bag to make sure she only ate “good candy”.